Sounds too good to be true, right? But in fact it isn't! 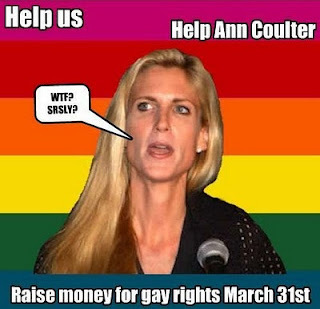 Click here and get your pledge on to help Ann raise money. She'll probably be too overwhelmed to thank you for your support, but you'll know in your heart that your donation is much appreciated. "...disease isn’t just biology. It’s a personal culture, shaped by stories, by people, by sexuality, by cities, by coincidences." My favorite Philosophy professor ever of all times would often start class with this phrase: let me tell you a story. So...let me tell you a story. 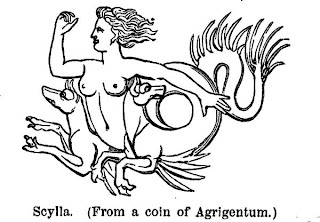 Once upon a time there was a beautiful sea nymph named Scylla. Everything was all sunshine and rainbows for Scylla until one day Poseidon, the god of the sea fell in love with her. This angered his wife, Amphitrite, who poured a poison into the pool that Scylla bathed in. The poison turned her into a monstrous multi-headed (yet perky-breasted) creature who lurked forever after under the rocks in the Strait of Messina (between Sicily and Italy), nomming on sailors who steered too close to the rocks. Once upon a time there was a beautiful sea nymph named Charybdis. She was the daughter of Poseidon and Gaia. Everything was all sunshine and rainbows for Charybdis until one day Zeus became angry with her. It seems that she habitually helped her father reclaim land from Zeus by riding the high waves Poseidon would stir up in his storms, consuming land and houses. For this Zeus turned her into a monstrous creature in the form of a whirlpool that lived in a cave across the Strait of Messina from Scylla. Three times a day the gaping hole (get it?) of Charybdis' whirlpool would open up and consume any sailors who steered too close to her cave. 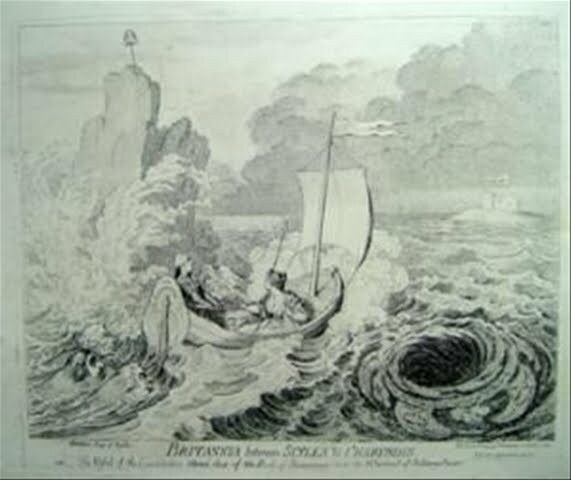 Together Scylla and Charybdis created a terrible hazard for sailors passing through the Strait. If they steered too close to either monstrous female, they would be devoured. There's a lot to be said about female sexuality and Scylla and Charybdis. In the ancient Greek worldview, women could endanger (in the male view) men in oh-so-many ways. They could endanger them by being beautiful and seductive, or by remaining loyal to another man. The simple act of being (or appearing to be) available to a man could bring down destruction on a woman. The simple act of being (or appearing to be) unavailable to a man could bring down destruction on a woman. And the hazard of both scenarios lent itself to this myth in which somehow the men had to find a way to navigate a careful path between the two dangers. When you have young daughters you suddenly become an especially keen observer of the forms female sexuality takes in our culture. No matter what message you try to convey to them, your voice is practically drowned out by the multitude of messages (both explicit and implicit) they're constantly exposed to. And as others have pointed out, there are basically two different ways to be a female sexual being in our culture. You can be the pornified sexual object who exists solely for the male gaze and to fulfill male desires but has no independent sexual desires of your own. The other option, of course, is to be the prudish gatekeeper required by the abstinence-only, purity types. This kind of sexual being also has no desires of her own, but only engages in sexual acts to please her man. Since she doesn't have the uncontrollable sexual desires that her male counterpart does, it's her job to "just say no." Of course these are extreme versions of the options available, but a survey of the images of female sexuality that are ubiquitous in our culture reveals that these are by far the most prevalent and powerful. So these are the Scylla and Charybdis of contemporary modern female sexuality*. And somehow our daughters have to navigate a course through these hazards as they grow and explore their developing sexuality. They must not be too available to men. They must not be unavailable either. They must be pleasing and accomodating. They must not give in to male desire, thus defiling their pure bodies, but must charm and cajole men into being a "better" versions of themselves. On the other hand, they must not be too charming and accommodating or they might get themselves raped. And so it goes. *And even when female sexuality is portrayed as anything other than hetero, these paradigms still dominate. In the pornified version of female sexuality, lesbian desire is merely a performance for the male gaze, and in the purity version it's an unnatural perversion which one can learn to overcome. So, I recently had this conversation with a friend in which he kept using the term "morally bankrupt." He said (among other things) that his upbringing and immersion in the consumer, throw-away culture had left him morally bankrupt. And his implication was that this is the result for all of us, more or less. Whether you agree with that point or not (after all, consumerism is just one aspect of our culture), the term "morally bankrupt" jumped out at me. Of course I've heard it many times before, but what exactly do we mean by it? Can a person be morally bankrupt? Is morality the kind of thing you can stock up on or save up, like in a bank account? Is it an asset that must be carefully balanced against liabilities to avoid bankruptcy? Obviously it's just a metaphor, but I think the metaphors we choose are really revealing. When we talk about greedy executives or corrupt politicians we almost always use the phrase "morally bankrupt," as if morality is quantitative like that. Maybe the problem is that we think of morality that way to begin with.